Winter time is penguin nesting season! This is a critical time for the little penguins as they spend more time ashore to find a mate, lay some eggs and raise the chicks. To ensure minimal disturbance to the penguins during this time, the WA’s Parks and Wildlife Services take a limited number of visitors on an escorted walk of Penguin Island as part of their winter cruise program. Read on below for full details. Our usual Penguin Island ferry and cruise schedule will resume on September 15, 2018. IS THE PENGUIN ISLAND WILDLIFE CRUISE SUITABLE FOR ME? It’s perfect for everyone and a great way to see a lot in a short time. The cruise stays within the sheltered waters of Shoalwater Bay so it’s smooth sailing and sea sickness is highly unlikely. It’s suitable for all ages and people with limited mobility. Our gangways and glass bottom boat are wheelchair and pram friendly. For the guided walk component there are 2 grades of walk on offer. The first is an easy walk for the average person but includes some sections along the beach and several steps up to the southern lookout. For people with limited mobility, there is an alternative wheelchair friendly option along the northern boardwalk. If you would prefer not to walk, then you’re welcome to rest under the trees in the picnic area. On the boat, it’s important that you are adequately dressed because it can be cold, especially in winter. A warm weather proof jacket is essential. Gloves, scarves & beanies for the colder days are a good idea. We recommend comfortable shoes and a rain jacket for the guided walk on the island. We visit the wildlife sanctuary zone of the marine park which has the best viewing opportunities including the Australian Sea Lion! There can be up to 30 sea lions ‘hauling out’ on the beach at Seal Island but numbers vary especially during the breeding season. There’s lots of sea birds and we typically sea pelicans, ospreys, terns and cormorants most days. We will also do our best to find you some dolphins but this can’t be guaranteed as our cruise is restricted to inside the sheltered waters of Shoalwater Bay. The dolphins do spend a lot of time here but they also go out to sea at times where our glass bottom boat is not licensed to go. 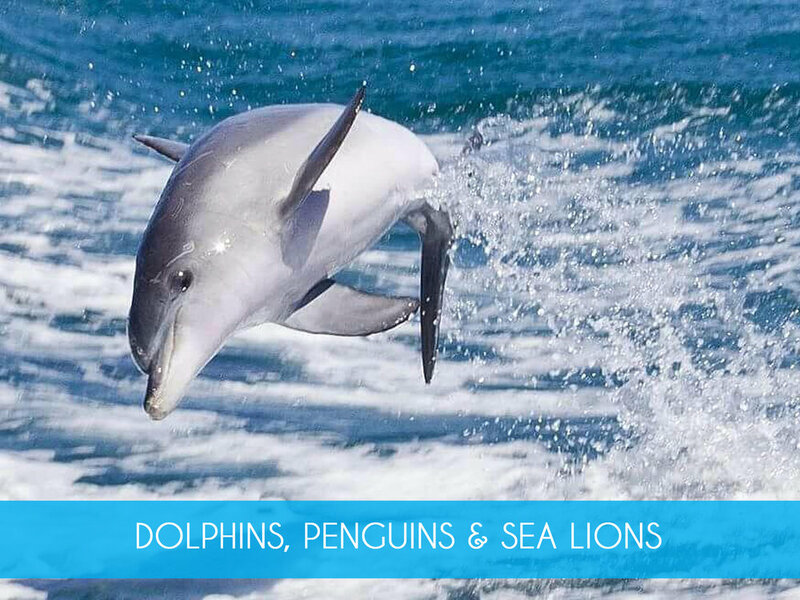 If you really want dolphins then consider our Adventure Cruise or Swim with Wild Dolphins Cruise which operate from September 15 to early June! Will we see little penguins during the guided walk? Winter is nesting season for the little penguins so there are plenty that stay on the island during the day at this time of year. Please understand that this is a critical time for the penguins and most will be tucked up in their burrows and within nesting boxes sitting on eggs or attending to chicks so sightings are likely to be brief and can’t be guaranteed. As we walk around the island, your guide will be pointing out nesting boxes and burrows and if we’re lucky, you may spot little penguins at the entrances. If you’re lucky enough to spot a penguin we ask that you remain quiet, move slowly and give the penguin plenty of space (at least a few metres). Also please ensure your flash is turned off if taking photos. WHAT WILL WE SEE THROUGH THE GLASS BOTTOM? Beneath the surface Shoalwater Bay has an interesting diversity of marine habitats including seagrass meadows, limestone reefs and sandy sea beds that are home to plenty of fish, crabs, stingrays, rock lobster, octopus and more. Our guides will endeavour to share the best underwater viewing on every cruise, however, visitors should not expect brightly coloured tropical reef and fish that they may have experienced on other glass bottom boats. The colours here are more subdued as we’re operating in temperate waters and we also don’t feed the fish to attract them under the glass (it’s bad for their health and the environment!). Viewing Shoalwater’s underwater world is just one component of our Penguin and Sea Lion cruise and some days limited visibility can make it difficult. Most of the local wildlife and scenic highlights are above the water so this is where our guides will focus your attention.